Metrics or KPIs, are important part of any strategy. To achieve something one need to find the way to measure it first. Any strategy is unique, it means that most KPIs need to be tailored to the needs of the particular strategy. Here we compiled some case studies that show how users of BSC Designer define and align their strategy with KPIs. Feel free to share your thoughts in the comments. We are a small company, but we need to manage our performance as well. We needed to set goals and KPIs to monitor, evaluate, review, and manage them using a powerful tool. We are a consulting company in Northern Greece and the BSC Designer software gives to our company an opportunity to offer a new product to the Greek market, where these kinds of tools are missing. It is an easy and friendly to use software that gives the opportunity to small and medium companies to use a powerful tool for managing their performance. Also it gives them the ability to create their strategy easily, and to set goals, connect them with their business target and KPIs, and finally to manage them. The diagrams and the dashboard give a fast overview of the results and indicate the fields of interest. Thank you for your comment. The mentioned approach to a creation of a strategy will provide your clients with a big picture of what’s working well and what’s need attention in their business. As you said, it is crucial to connect business objectives with each other, as well as with Key Performance Indicators. Before doing any dashboard or KPI job a company’s top management needs to formulate their strategy. In the software we have a strategy map for this. The strategy should answer “why?”, “what?”, and “how?” questions. Why a company needs to do something, what exactly a company needs to do and how it is going to do this. 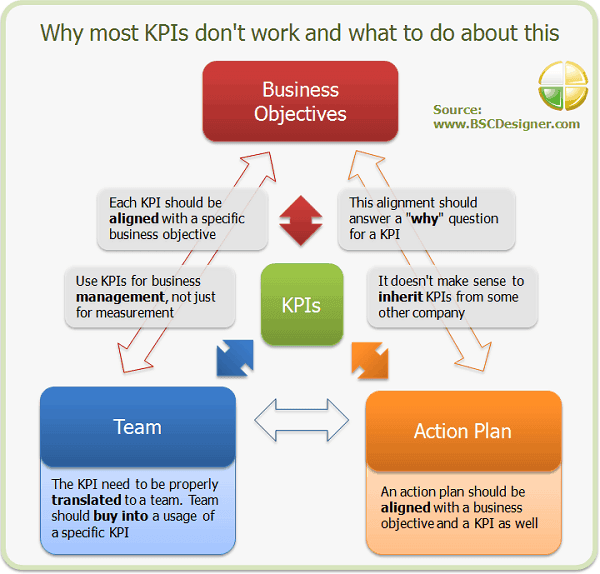 I saw many companies that begin with KPIs, but this approach is wrong and won’t deliver expected results. We were discussing this idea in details. 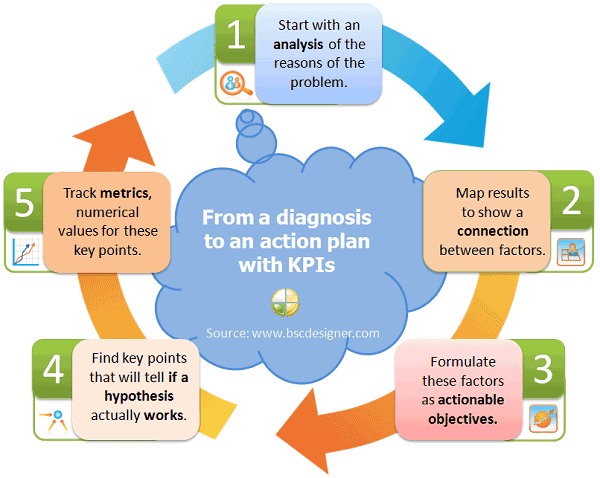 When a strategy map is ready then it is time to design KPIs. A typical mistake here is that people confuse a simple metric with a KPI. The first one helps to measure some important business numbers, but it is not really crucial for the ultimate business performance. Another pit-fall is that each business unit might need its own KPIs. For example, for a top manager a “lead to sales” conversion might be a simple metric, while for the manager of sales department it will be one of the KPIs. These questions were discussed in another article. When you have KPIs in place and a strategy map designed, you can align your business objectives with KPIs and an action plan. Here you will find useful visualization means like diagrams that you mentioned and dashboards. BSC Designer provides various means and will make the process of performance management really pleasant. BSC Designer helps with the implementing of my company’s strategy and creating the key performance indicators in a professional way. I am trying to understand BSC via the BSC Designer. It seemed to me that I can learn from BSC Designer more than what I have studied in different costly courses. It seems the product is easy to use, lucid and I can recommend it to anyone who is interested in knowing more about planning strategy. Thank you a lot for your feedback. When we created BSC Designer we had business people in mind, not technical people. That’s why it is easy to install and doesn’t require complicated installations; that’s why the process of Balanced Scorecard design is as simple as working with a MS Word document or Excel spreadsheet. 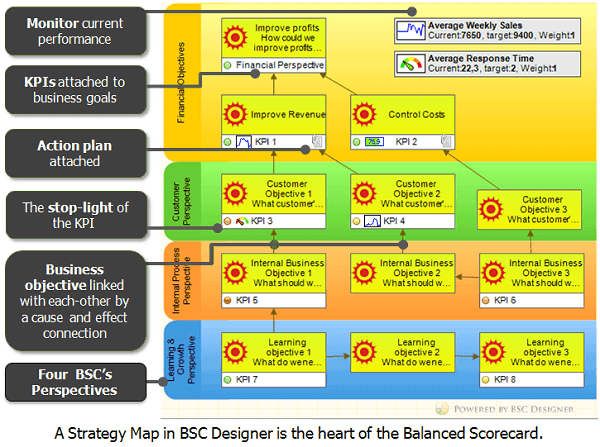 Being this simple, BSC Designer provides a lot of automation for the Balanced Scorecard. The problem with costly courses that you mentioned is that they are theory-oriented. Unfortunately, it is hard to teach the strategy approach in theory without showing an example of how promoted ideas can be done in practice. Another problem is that in most cases the strategy map and the balanced scorecard of the company are for internal use only. That’s why we don’t see many examples of the scorecards, as we were commenting before, only few companies show their scorecard projects. As a result, learning the Balanced Scorecard method is hard without having a tool where one can try all the ideas. Fortunately, BSC Designer is now used not only by executives, but for education purposes. In the latest upgrade we realized a number of features that will help to plan a strategy with success. For example, now on the “Business goals” tab one can not only specify business objectives, but you can also specify a cause-and-effect connection between them. Another improvement is that KPIs aligned with a business objective are now visualized on the strategy map as well. Check out this step-by-step guide to learn about the new way to work with a strategy map. Finally, for anyone who wants to know more about the Balanced Scorecard concept, I would like to recommend visiting the articles section on our website. You will find articles there according to various problematic areas of the BSC, for example, KPIs or implementation of the BSC or cascading. BSC Designer is used in DCM (Spain), company involved in designing and manufacturing tailor made machinery for food industry, mainly fish and meat processing. 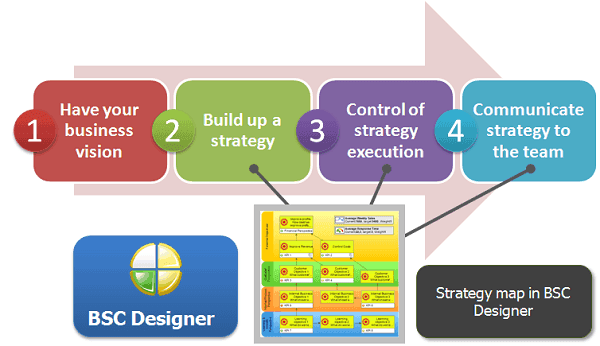 We use BSC Designer to manage our strategic plans, indicators and initiatives. Also we want to use it in the near future to manage quality and environmental indicators and use it as a tool for variable retribution matrix evaluation. After testing some independent BSC solutions of the market, we decide to use BSC Designer because is easy to start and maintain, it is really easy to input data and the software is very intuitive. It helps us to turns our data into knowledge. It provides almost all means that we need to manage our strategic plans and probably, in the near future, all our management indicators. It is the best price/quality choice in the market. Diseño y construcción de maquinaria automatizada S.L. Thank you for the detailed explanation of how you are using BSC Designer now and plan to use it in the future. With the current approach you are on the right track as strategic plans are developed simultaneously with KPIs and initiatives. In this way you can provide your business with tools (KPIs, business objectives, initiatives) with a right business context. I believe that your plan to implement in BSC Designer with even more KPIs depends on how easy it would be to access necessary data. BSC Designer provides several basic means that one can use to access necessary data. You can import your data from MS Excel or use SQL indicators to access data from a company database. We understand that each company might have its own format for storing data, so let us know if you need any help accessing some specific data sources. Besides having an easy to start and maintain product, we also localized it to local markets. We have customers from Spanish-speaking countries. The software is also localized into Arabic and Chinese. All together: the software’s easy installation, effort-less maintain and localization to local languages make it popular not only in the US or Europe. That is confirmed by the numerous users’ comments like this one. We are on the stage of building new strategy of the bank using BSC and KPIs. Seems like BSC Designer is a great instrument to build up strategy, control execution and involve all team into realization of vision. All necessary steps are described. Maps and dashboards let us visualize strategy in a clean understandable picture. Navigation is very intuitive and clear. Would be very interesting to try your software in strategy building and implementation processes. Thank you again for your opinion. According to your feedback I must say that you understood the Balanced Scorecard approach 100% correctly and for sure you are on the right track with building a strategy map. With this approach a success of the BSC project is guaranteed. 1. Have your business vision. A Vision of the company is a general understanding of how a company is going to achieve its goals. Any business starts with a vision, even if the founders don’t have it in a written form; they have a leading idea that is a basis of their business. Other business tools, such 7-S framework also include company values here. It is obvious that without the business values a company’s DNA is not 100% prepared for a new venture. In BSC Designer software we recognize the importance of having a vision and mission statement. We even dedicated a line on the tool bar to mission and vision panel so that a company can enter its vision statement. 2. Build up a strategy. Strategy is a detailed plan for a vision. It consists of business objectives linked by cause and effect connections that lead one from the starting point to the end result. In the Balanced Scorecard framework top managers are supposed to build a strategy from up to down, e.g. start with desired result (financial outcomes) and then build a tree of objectives that will permit achieved planned financial results. 3. Control of strategy execution. For that purpose KPIs are added to the Balanced Scorecard. A typical mistake that companies do is starting with KPIs. Although in some cases we have no chances, it is better when a strategy is clear enough and KPIs are designed to control the progress of achieving certain business objectives. 4. Communicate strategy to the team. Employees make things happen. They need to have access to a strategy map, as well as to initiatives that contain a detailed action plan. Thank you again for sharing your experience, I’m sure it will be useful for any company that decides to start with building a strategy.